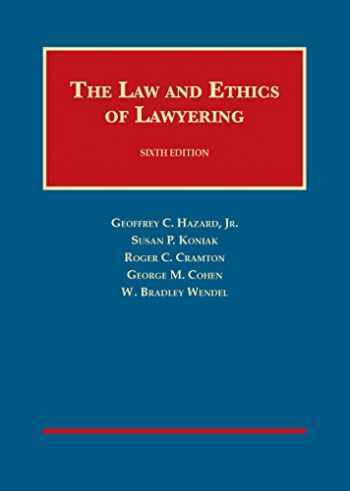 Acknowledged author Geoffrey Hazard Jr wrote The Law and Ethics of Lawyering (University Casebook Series) comprising 1340 pages back in 2017. Textbook and etextbook are published under ISBN 1628100354 and 9781628100358. Since then The Law and Ethics of Lawyering (University Casebook Series) textbook received total rating of 4 stars and was available to sell back to BooksRun online for the top buyback price of $80.37 or rent at the marketplace. This casebook provides an overview of the wide range of legal and ethical issues facing lawyers in practice. As did prior editions, the Sixth Edition integrates discussion of the ABA's Model Rules, the ALI's Restatement of the Law Governing Lawyers, as well as case law, statutory law, and regulatory law governing lawyers. The Sixth Edition includes extensive new coverage of Ethics 20/20 revisions to the Model Rules and new principal cases on conflicts of interest.